Red Eléctrica operates the Spanish electricity system, both the peninsula and no-peninsula systems, guaranteeing security and continuity of supply. The operation of the system encompasses the activities necessary to ensure the security and continuity of supply, as well as the proper coordination between production and transmission, ensuring that the energy produced by the generators is transported to distribution networks under the quality conditions required by the regulations currently in force. One of the characteristics of electrical energy is that it cannot be stored in large quantities. This means that, for the correct functioning of the electricity system, the amount of energy generated by the power stations must be exactly the same as that being consumed at the exact moment it is being demanded. In other words, a constant balance between generation and real-time demand must be maintained to avoid unbalances which could represent frequency deviations with regard to the nominal value of 50 Hz. 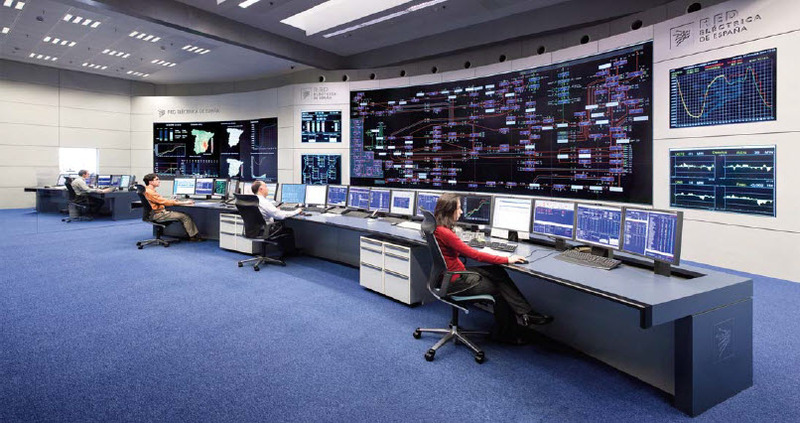 The role of Red Eléctrica, as system operator, consists on ensuring this balance in the Spanish electricity system.To this end, it produces the electricity demand forecasts, oversees the operation of the generation facilities and manages the transmission facilities in real-time, constantly ensuring that scheduled generation in power stations matches consumer demand. Should a difference arise between the two, it sends the appropriate instructions to the power stations to increase or reduce their electricity production is such a way that it ensures the safety margins necessary to face possible unexpected losses in generation or changes in scheduled consumption. In the peninsular system, Red Eléctrica is also responsible for managing what is known as the ancillary services markets; markets which allow the generation schedules freely established by balance responsible parties in the day-ahead market and bilateral contracts, and subsequently in the intraday markets to be adjusted to the quality, reliability and security requirements of the electricity system. Ancillary services or the adjustment markets are understood as the means available for the resolution of technical constraints of the system, the allocation of ancillary services and the management of deviations. In order to ensure the constant balance between generation and demand in real time in the non-peninsular systems of the Canary Islands, the Balearic Islands, Ceuta and Melilla, Red Eléctrica carries out an economic dispatch of the generation units. Red Eléctrica prepares the annual power demand evolution forecasts, together with the relevant coverage, for the medium and long term. These forecasts are essential in order to draw up the transmission grid development plans for the upcoming years, which approved by the Ministry of Industry, Tourism and Trade. Adjustment service whose aim is to resolve the technical constraints of the system, by limiting and modifying, as deemed necessary, the production schedules of the power stations o pumped storage generation that allow technical constraints identified to be resolved with the lowest cost for the system, and the subsequent rebalancing of generation and demand to offset schedule modifications incorporated to resolve the identified technical constraints. Additional Upward Reserve Power. Ancillary service, of an optional nature, managed and remunerated by means of market mechanisms and whose purpose is to provide the electricity system with the necessary level of upward power reserve, taking into consideration the power reserve available in the forecasted schedule of the day-ahead horizon. Secondary Control Band. Ancillary service, of an optional nature, whose purpose is to maintain the generation-demand balance, correcting deviations with respect to the anticipated power exchange schedule of the ‘Spain’ Control Block, and the system frequency deviations. Its temporary action horizon ranges from 20 seconds to 15 minutes. This service is remunerated by means of market mechanisms via two concepts: availability (control band) and usage (energy). Tertiary Control. Ancillary service, of an optional nature, that, if subscribed to, is accompanied by the obligation to bid, and is managed and remunerated by means of market mechanisms. Its purpose is to resolve the deviations between generation and consumption and the restoration of the secondary control band reserve used. The tertiary control band reserve is defined as the maximum variation of power generation that a generation unit can perform within a maximum of 15 minutes, and which can be maintained for at least 2 hours. The participation of facilities in the optional ancillary services market requires prior authorization by Red Eléctrica as System Operator, which in turn, requires the successful fulfilment of specially established tests for these purposes. 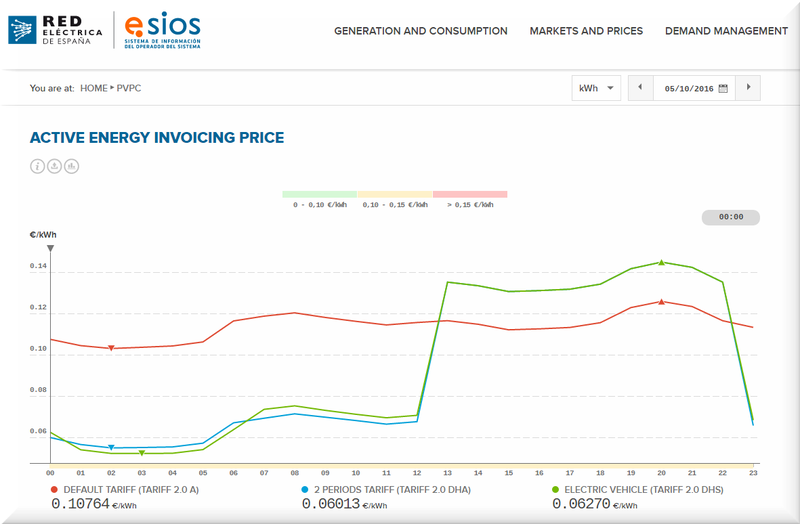 The test protocols are available on the balance responsible parties section on the e-sios website: https://www.esios.ree.es/en/balance-responsible-parties> Documentation> Help guides and documents> Technical notes. 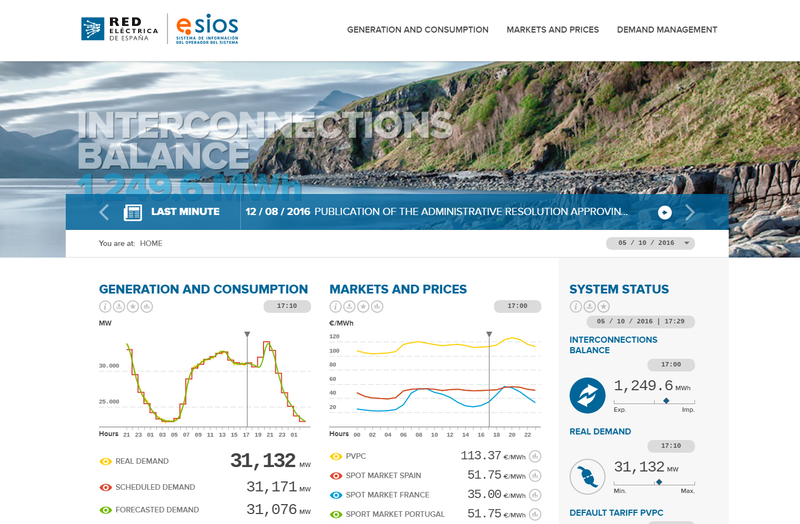 Visit the new public website of e·sios, the website of the system operator in https://www.esios.ree.es/en. Red Eléctrica publishes through its website the hourly pricing schedules of ‘energy used’. 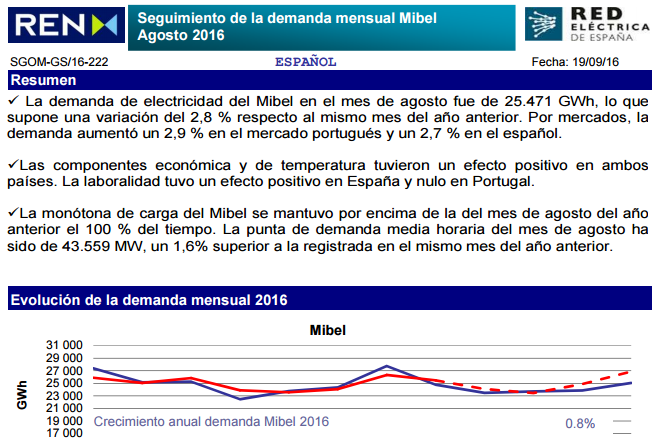 The Iberian Electricity Market (MIBEL) is the result of a joint initiative between the governments of Portugal and Spain, and represents an important step in the construction of the internal electricity market.